KATHMANDU, May 10: Fringe Madhesi and Janajati parties have accused the governing CPN (Maoist Center) and Nepali Congress of not abiding by the "gentlemen's agreement" to endorse constitution amendment bill before the local elections. The parties have said they will strongly oppose the local elections in the tarai, parts of which are the base of Madhesi parties, until their demands are addressed. During an all-party meeting held at the prime minister's residence in Baluwatar on Tuesday, Madhesi leaders demanded reasons for the delay in endorsing the constitution amendment bill. "We were told that the constitution would be amended before the first phase of the local polls. The adjournment of the House meeting means it's [amendment] not going to happen before the first phase of elections. We don't know whether the government is at all sincere about constitution amendment," Mahanta Thakur said at the meeting. Thakur also accused the government of not withdrawing criminal cases against Madhesis in connection with the Madhes movement. In the third week of April, the government had reached an understanding with the Madhesi parties to endorse the constitution amendment bill before the first phase of the local polls. 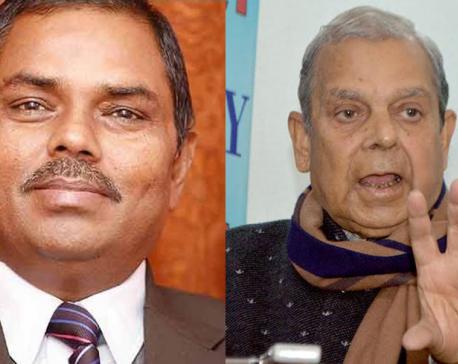 Following the informal understanding, Madhesi parties had announced that they would participate in the elections. But Madhesi leaders on Tuesday threatened 'to do everything' to oppose the second phase of local polls, if conducted without amending the constitution. Four provinces including Province 2, the base of the agitating Madhesi parties, are slated to go to the local polls on June 14, exactly a month after the first phase. "It looks like the government plans to hold elections in Madhes through the use of force. We will do everything to resist it. Such a move would certainly backfire. The government should take the responsibility if anything untoward happens," Rajendra Mahato told Republica. During the meeting, Prime Minister Pushpa Kamal Dahal asked Madhesi parties not to doubt his commitment. "I tried my best to endorse the amendment bill before the candidacy nomination process. But it could not happen due to lack of support from other parties," Prime Minister Dahal told Madhesi leaders, according to his personal secretariat. Though the government was preparing to endorse the constitution amendment bill before the local polls, it failed to do so after a section of the Rastriya Prajatantra Party leaders refused to support the bill. Prime Minister Dahal said that the government was exploring possibility to endorse the bill on May 18. "I am working to create atmosphere to amend the constitution as soon as possible. I urge you (Madhesi parties) to begin preparations for the second phase of the polls," said Dahal.